This is still a very common myth about happiness and it is completely plausible to assume that happiness has no rules. For all we know, it could come or go just like the wind. Why? Simply because happiness is complicated, most people don’t know what triggers it. If you ask someone (try it and you will see) what happiness is they might answer with a stream of buzz phrases [such as health, money, friends, family, job security etc.] Are they right? Well, yes and no. In general, all of these things have the potential to increase how content we feel, but only if we know how to make gratitude a larger part of our lives. For instance, it can teach us how we can enhance our life through the little things. While happiness seems like a complicated concept, it appears to be as random as roulette. Although, we know, roulette is far from random, we continue to believe that such a thing as ‘randomness’ actually exists…Truth be told, we simply do not know all the parameters of roulette, just as we do not know the exact ‘mechanisms of happiness’. Like with roulette, if we knew all parameters, we could predict the winning number with almost every turn. Psychologists may claim that we have not discovered all the pillars of happiness yet, but even if this statement was not false, we would still know enough about happiness to know that we can influence our emotional state to make our lives more fulfilling. As you may know, true happiness is unconditional. This means that it does not abide by the conditional factors, upon which we base our moods, lives, even our very identity. Therefore, half of our conditional happiness is determined by our genes, so [to some extent] happiness is given. However, the other half of conditional happiness is affected by our lifestyle [i.e. what we do on a daily basis]. Ultimately, how happy we are on a conditional level is our responsibility. Conversely, if we do not understand how happiness works, then it will seem as though happiness is given to some more freely, whereas others cannot find any at all. Once we know that conditional happiness is a byproduct of other things, which are equally as conditional, we may grasp the concept of unconditional happiness. Prior to the ebb and flow of real life, happiness is neither given nor self-made: It is an infinite state of being that co-exists eternally with our finite existence. Anyway, since few can imagine being truly happy in the complete absence of anything physical, we must first focus on the part of our happiness that we feel we have control over [however imaginary or non-externalised said control may be]. Have you ever thought that if you only would achieve X or Y, you will be happy for the rest of your life? I did and I jumped from one achievement to another always expecting to find happiness eventually. Not only does it not work, it is the nature of the mind that drives us to such behaviour. Sure, we are content for a short time after achieving a goal, but the level of happiness drops soon after [accompanied by feelings of frustration]. It has been announced that the next edition of the Diagnostic and Statistical Manual of Mental Disorders will include a new condition, Islamopathy, which displays elements both of sociopathy and of cult groups (1). Classified as a personality disorder, Islamopathy is characterized by enduring antisocial behavior towards outgroups, diminished empathy and remorse, and disinhibited behavior, often accompanied by free floating rage. 1. Excessively zealous commitment to the leader (Mohammed, a 7th century warlord) and his belief system/ideology. 3. The leadership dictates, sometimes in great detail, how members should think, act, and feel (for example, what types of clothes to wear, who to marry, how to discipline children, which foot to enter the toilet with and so forth). When I was a child, they said, war was something that only happened in other countries. When I grew into a young women and 2012 passed us by, they said, the apocalypse is something that the next generation will see…but now, I can hear the doubt in their voice and I can see the fear in their eyes. Now, after so many years, I can so easily tell when they are lying to themselves. However, they are not the only ones. 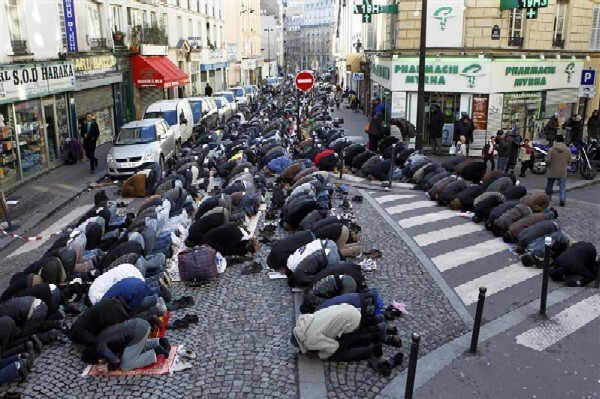 World-War: Islam is evidently forcing its way into many countries that are not very fond of its presence or its laws. Currently, everyone is simply waiting for a small spark to ignite the fuse and burn through Europe. Despite the fact that many people are in denial that Islam is setting up strategic invasion points in the form of strong holds. Moreover, these mosques have been found to contain smaller and larger arsenals of weapons, ranging from semi-automatic firearms (in the UK) to a nuclear warhead (in France). Mass Extinction: With every passing day, a substantial number of animals succumb to the exposure of toxins that we are pumping into their environment. Without them, our survival is not only compromised…Our entire way of life would change in the blink of an eye. It should be noted that whereas wild animals lose their natural habitat through disaster, extreme temperatures or deforestation. Additionally, once their natural habitat has been ravaged, they cannot maintain a steady food or water supply without impinging on what we consider to be ‘ours’. Many cannot find refuge amongst humanity, except for kill shelters. On a separate note, the number of animal deaths is accelerating beyond the amount of human casualties. If we were to lose as many members and/or variants of our own species, we would be overcome with sorrow, despair, or even desperation…We would not be able to deny that which is happening right in front of us. Rationing: California is the perfect example of how a normal area, located can almost hunger and thirst to death by the water. Survival techniques such as evaporating salt-water into a drinkable form are of little use, when the pollutants condense along with water molecules. Conversely, crop failures due to extreme weather and natural disaster has become more widespread than anyone would like to admit. Mass Suicide: Canada has declared a state of emergency as a result of over 100 suicides, involving Native Americans, in a period of 6-8 months. To elaborate, Native American teachings are very specific, when it comes down to ritual suicide. Similar to the Vedas, they do not permit ending one’s life, unless to avoid suffering through the inevitable. (Like the Hopi prophecies predicted when white man seized a large proportion of indigenous territories) A friend of mine consulted a Native American on the subject and she confirmed that selective traditions allow for desperate measure, but they generally warn that even if justified, suicide has consequences that affect the next rebirth. Wealth Inequality: According to NASA, civilisation collapse is often fuelled by unequal wealth and resource distribution. Now, we already know a handful of people own almost everything. (Please view William Domhoffs research) But when times are hard, food as well as water becomes scarce. During the California drought, the rich transported trucks full of pristine bottled water that was denied to the average person. To die of thirst takes approximately one week, dependent on how fast dehydration becomes terminal. It is a slow, grinding process that encompasses a shut-down of clear thinking. (For example, if you’ve ever been really hungry or thirsty, multiply this by a million. You can’t think clearly, breathe without nausea, dizziness or stabbing pain. The longer time progresses, the more you’d be willing to do to satisfy base survival needs.) Truth be told, it takes a great amount of effort and self-discipline to keep one’s head, even when the situation is not on an apocalyptic scale. Floods: Sea-levels are rising, as the Arctic is melting, which is old news. What we don’t consider is that this inflow of fresh, clean water can end one of two ways. (a) We utilise the water faster than it melts, which would not be surprising if temperatures continue to rise, pushing the planet beyond the point of recovery. The planetary environment would be irreversibly changed. (b) The planet engages in a natural reset, which takes the form of up to 40-100 year winter, an ice age or a massive natural disasters that allow nature to re-establish balance in order for the planet to survive instead of succumbing to man-made environmental changes.